At NewVue Communities, we are here to help YOU navigate the homebuying process as we believe that Information enables and Guidance empowers. Over the past 10 years, we have helped thousands just like YOU achieve the American Dream through our First-Time Homebuyer Education Classes. Both our in-person and online classes are CHAPA (Citizens Housing and Planning Association) certified. 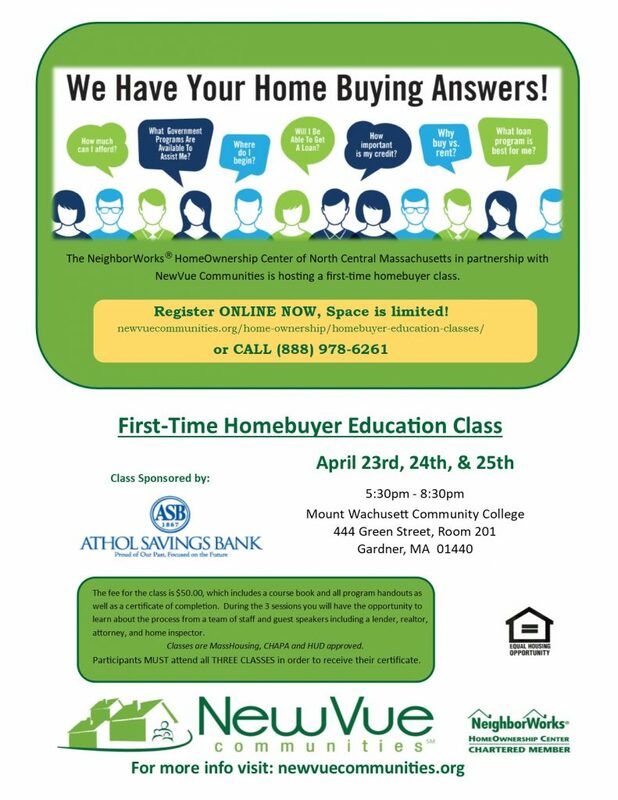 Homebuyer education classes are a total of 9 hours held on a monthly basis. During the 3 sessions you will have the opportunity to learn about the process from a team of staff and guest speakers including a lender, realtor, attorney, and home inspector. At the conclusion of the classes, you will receive a Completion Certificate. The in person classes are $50 per household. All classes are Tuesday, Wednesday and Thursday evenings from 5:30 pm to 8:30 pm, once a month, rotating between Fitchburg, Gardner, and Leominster. Participants MUST attend all THREE NIGHTS in order to get their certificate. Intake form and Payment are both required in order to be registered for a class. A non-refundable payment is required for homebuyer education course registration. When filling out the intake form, please make sure to reference which class month you are signing up for. Online homebuyer education gives you the opportunity to complete the class at your convenience and as your schedule allows. Upon completion of the online portion of the class, which generally takes 6-8 hours to complete, a one-hour in-person session will need to be completed to receive your Completion Certificate. The online classes are $75 per household. In order to register for the online course please CLICK HERE. La educación en línea de comprador de vivienda le da la oportunidad de completar la clase a su conveniencia y como su horario lo permita. Al completar la parte en línea de la clase, que generalmente tarda entre 6 y 8 horas en completarse, se necesitará una sesión de una hora en persona para recibir su Certificado de finalización. Las clases en línea son $75 por hogar. Para inscribirse en el curso en línea, HAGA CLIC AQUÍ. Se requiere un pago no reembolsable para el registro del curso de educación para compradores de vivienda.